This summer Little Ladybug Shoppe will be donating handmade blankets for the hospital to give to families who lose infants. I Pinterested several ideas for baby blankets and decided to try my hand at a chevron quilt. Although, since I am newish to sewing, it's not flawless, but I am pleased with the results, and hope it can be a blessing to a hurting family. Start with 1/2 yard each of two coordinating fabrics. Cut 8, 8-inch squares from each piece of fabric (because of seam allowances, these squares will end up being 6 inches). Place the two squares on top of each other, right sides together, pin, and sew with a quarter-inch seam allowance. Then (and this part feels sort of scary), cut each square sandwich on both diagonals until you have four triangles. When you open up the triangle, it should look like this. Make sure to press the back seams open. Thoroughly confused? I would be too. I learn much better from videos. This is the one I used to help visualize the process. And the lady seems so sweet! For a 30x36 blanket, you'll want to arrange five squares across and six squares down. Pin and then sew each horizontal row. After the rows are done, sew each horizontal row together to build your quilt vertically. Press and then your quilt top is done! To finish, pin a 30x36 piece of minky fabric to your quilt top, right sides together. You'll want to pin every couple of inches because minky is, for lack of a better word, slippery. Also, I've read that a zigzag stitch is best with minky fabric. Sew all the way around, ensuring that you leave a small opening to turn the fabric right side out. Once the fabric has been turned, press, top-stitch, and you're done! Isn't it adorable? If you end up making a similar chevron quilt, please share pictures, I'd love to see it! Thank you! I will be sad to give it away haha! Thanks! It's not imperfect for sure, but I do love the pattern. It is so pretty and feminine. 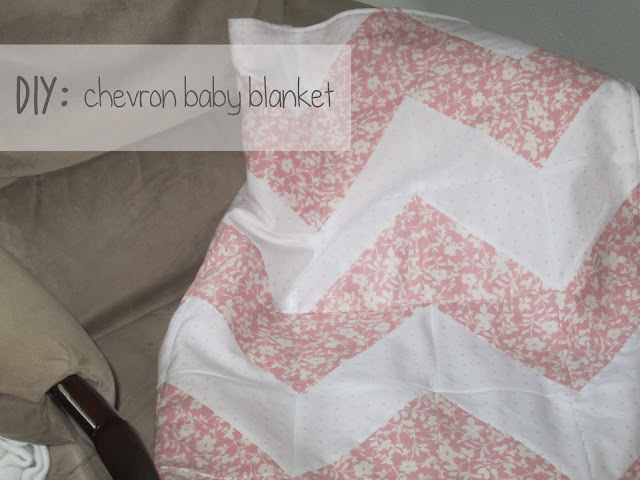 I have looked at several of these chevron quilts on pinterest, but never attempted them. You made it seem very simple. :) I think I might just go for it. You should try! It really isn't too difficult. I am a verrrrry beginner sewer and it turned out well. It takes some time but not difficult!